**Excuse my facial expression, lol @ me trying to be fierce. You can see that my Day 2 braid-out is much more shrunken than my Day 1 braid-out. Probably due to the fact that I shower without a cap and the moisture causes it to draw up. The picture doesn't do this style justice, it was big and SO CUTE! I kept this style for 2.5 days, anymore leads to crazy knots for me, the style also shrinks as I move along. Tutorial: Plat A LOT (idk the exact number, at least 40) braids, (I kept them in for a week) take them out, fluff with your favorite moisturizer. This winter weather is making it extremely hard to maintain moisture. As long as I'm not going out, I'm keeping my hair in protective styles. I'm Back & Have Lots to Share!!! Here's a link to my original Cinnabun post. I added a headband to the front this time. Kiddie-inspired style from Texture Playground. Here's a direct link to the original style for which this was inspired by. If you have a little one, the original link has a handful of style options for kids, check it out! If you're a "big girl" like me, you may be wondering why I'm using a kiddie-style for my hair. Well...I think we have more creativity in our hair styling with our little ones than we do with ourselves. Granted some of the styles are "young" but I would argue that we can morph them into adult-appropro styles. That's what I tried to do with this style. I think I did well! 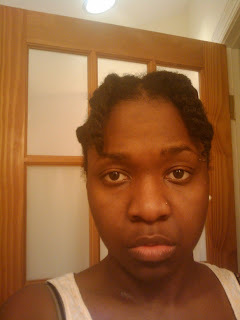 "Tutorial:" Plat two medium size twists in the front. Plat two braids on the side of your head (near the temple and above the ear) and pin them back with a bobby pin. Plat 7-10 twists in the back section. Pin them with bobby pins to make an 'X'. VOILA! Add a clip/pin for decoration (optional). You can pin the twists in the back however you want. Try a bun, fold them into a cool shape/design. Be creative! Depending on your hair's length you may have more options with what to do with the back section, the 'X' was my best option for my hair's length. I will gradually update this with the other styles I've been sporting. 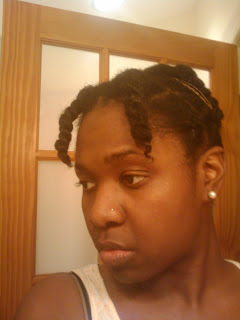 I have a FIERCE, FIERCE braidout on its way!!! 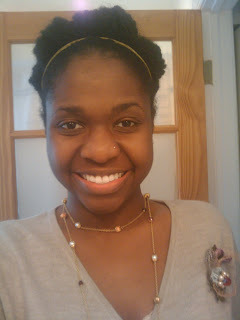 OK everyone, for myself and followers, let me make it clear: I love having natural hair. I love the freedom from chemicals, displaying the beauty of my heritage and the individuality. Yesterday I was so frustrated with my hair, I thought about locking it again. 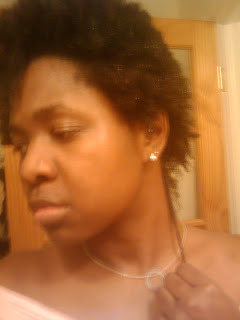 Do you see the shrinkage on my hair? 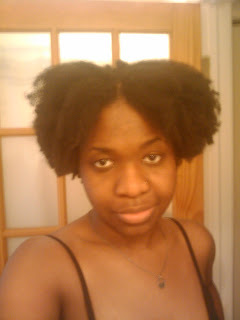 My shrinkage is probably 75% here, SMH. 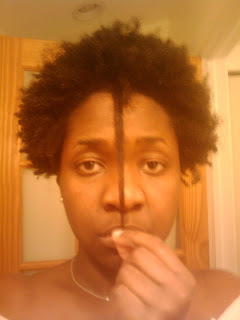 However, when I look at my stretched hair I see growth. Also, when I compare pictures - I see growth (about 6.5" over 16 months OR 0.4"/month). 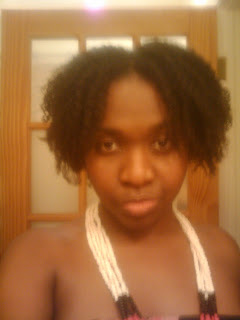 *Hair is supposed to grow on average 0.5"/month* This is a pic of me from August 2008. Do you ever feel like you're running a continual race? By continual, I mean a race with no finish line. You're running and progressing and you think you're almost at the end AND THEN you realize that you've only just begun. Well, that's where I feel I am with my natural hair. I've come a long way, but I'm still just at the beginning of my journey. I'm getting tired...AGAIN (i.e. I'm going to start locs for myself this weekend). Those of you who know me know that I am very impatient when it comes to my hair. I just want it to grow like white people's weeds. I'm at a point again where I have little fairy knots at my ends and I don't know what to do. 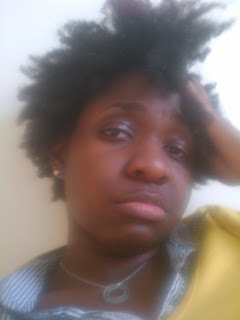 I keep it moisturized, clean and stylish, but my hair continues to outwit me. It's as if it has its own personality, or almost as if my hair has an alter ego. I wish I could talk to my hair and say: "What the feezy HAIR? Why don't you just grow? 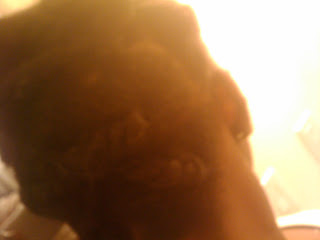 Stop knotting at the ends and absorb all of the goods oils and conditioner I give you and grow." Unfortunately, hair doesn't talk or listen, so I'm just stuck with continuing this marathon-like race with it...hopefully I figure out what it needs. SIGH.